Replacement fillings and bonding, crowns and bridges are the most common corrective cosmetic dental procedures that can make a real difference to your smile and your teeth. Natural wear and tear, grinding your teeth, or accidents, can cause a smile to look as if it has seen better days. 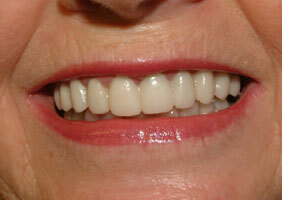 Bonding is a skilled and artistic way of lightening and changing the shape of teeth, or closing small spaces or gaps. When the damage to a tooth is too great to be restored by a composite or porcelain inlay, a crown is often the chosen treatment for the cosmetic dentist. 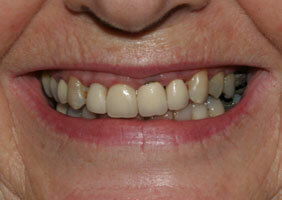 For spaces where teeth are missing, a bridge can be used to replace the teeth. 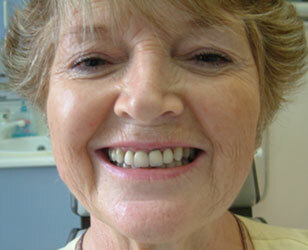 This means that you will not have to wear a denture or false tooth to fill in a gap. Inlays and bonding using composite material can cost from around £100 per tooth. The price of crowns varies depending on the type of material used and can cost from £150 to £500 per tooth. The same is true of bridges which can cost from £150 to £500 per tooth. Natural wear and tear, grinding your teeth, or accidents, can cause a smile to look as if it has seen better days. Your dentist can restore teeth to a more natural, pleasing appearance with a variety of different techniques and procedures to improve the colour, shape and size of your teeth. In this section we will briefly look at some of the most common cosmetic dental procedures that can make a real difference to your smile and your teeth, including replacement fillings and bonding, crowns and bridges. Bonding is a skilled and artistic way of lightening and changing the shape of teeth, or closing small spaces or gaps, in just one visit to a dental surgery. When the damage to a tooth is too great to be restored by a composite or porcelain inlay, a crown is often the chosen treatment for the cosmetic dentist. For spaces where teeth are missing, a bridge can be used to replace the teeth. This means that you will not have to wear a denture or false tooth to fill in a gap. If you are considering cosmetic dentistry, the following information will give you a basic understanding of the procedures. It can't answer all your questions, since a lot depends on the individual patient and the dentist. Please ask your dentist about anything you don't understand. What happens during Replacement Fillings and Bonding? Everybody knows what metal fillings look like. The metal material used to fill teeth is called amalgam and has been around for a long time. Although reliable and hardwearing, these fillings are not cosmetically appealing. In the early 1990’s a new generation of resin-based tooth coloured filling materials called composite became available to dentists. This material has been developed so that it is now as strong as amalgam, but comes in a range of different shades, allowing the dentist to match the filling to the natural tooth shade exactly. In most cases, it is now easy for a dentist to replace existing metal fillings using this composite material, as well as to replace older “white” fillings in front teeth that have become discoloured. Only a very small amount of preparation is required to roughen the surface of the tooth, and the dentist then places colour-matched composite resin on the tooth, and carefully shapes it to the desired effect. A special light is shone on the material to cause it to set in seconds, and then the tooth can be adjusted and polished. Bonding results last for 5-10 years. The material, however, does lose its shine over time, and stains and plaque easily stick to it. As the results begin to fade, bonding can be repaired or redone. What happens during Crown treatment? Crowns, or "caps" as they are sometimes called, are complete shells that cover and protect a tooth. Crowns can be made from precious metals such as gold, tooth coloured porcelain with metal underneath, or all-porcelain. How are crowns applied to your teeth? After assessing your suitability for crowns, some preparatory work is done on the tooth to be crowned, and a mould taken of the teeth involved. Crowns are custom-made and may take a week or so before they are ready, so a temporary crown can be used while you are waiting. Crowns can last up to 15 years, depending on the material that they are made from. What happens during a Bridge treatment? Like crowns, bridges can be made of different types of materials, and are fixed in place by attaching them to the tooth or teeth next to the gap, to fill the space. How are bridges applied to your teeth? The dentist does some preparatory work on these teeth, and takes a mould of them. The bridge may take a week or so to prepare, and a temporary bridge can be used while you are waiting. Once the bridge is in place, it is often impossible to tell it from the rest of your teeth. Bridges can last up to 15 years, depending on the material that they are made from. 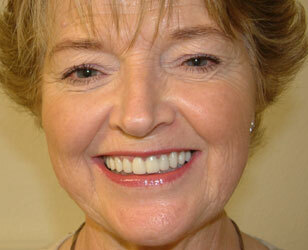 Who can perform the Cosmetic Correction of Teeth? What is the average cost of the Cosmetic Correction of Teeth? Inlays and bonding using composite material can cost from around £100 per tooth. Prices vary depending on the type of material used - from £150 to £500 per tooth. These include replacement fillings and bonding, crowns and bridges. Click for ALL Teeth Cosmetic Correction clinics in the UK & Ireland registered and verified by Consulting Room.